This just might be the best banana bread recipe! You’ll need ripe bananas, flour, butter, eggs, brown sugar, and spices. It’s so good, you’ll want to make 2 loaves. So many great reviews! Jump to the Easy Banana Bread Recipe or watch our quick recipe video to see how we make it. We’ve been making this classic banana bread recipe for years and we knew we couldn’t miss the opportunity to share our own easy version with you. Just in case you are looking for something a little lighter? You might want to check out our healthier banana bread. The recipe calls for lower sugar, olive oil instead of butter, and adds whole grains. Use ripe bananas. The bananas you use for banana bread matters. There is no point in baking up a batch of banana bread unless you are using ripe bananas. In fact, if you can wait a day for browned, overripe and speckled bananas, it’s even better (I really don’t think bananas can be too ripe for banana bread). If your bananas are still green, wait a day or two. You won’t regret it. Bake them. For a really quick option, you can bake bananas in their peel to ripen them. This trick works best when the bananas aren’t completely green and instead are already starting to ripen. To do it, line unpeeled bananas on a baking sheet and bake in a 300F oven until they look shiny and black (15 to 30 minutes). Don’t worry if some banana or juices leak out while they bake. It’s the bananas that make banana bread so moist, sweet and flavorful. Once you’re ready with your bananas, the rest of the recipe comes together quickly. We use all-purpose flour, but you can use 100% whole wheat flour or a combination of whole wheat and all-purpose flour. A gluten-free flour blend also works. Just keep in mind that changing the flour from all-purpose will affect the texture of the bread slightly. Baking soda is our go-to leavener for banana bread. Since posting this recipe, quite a few of our readers have asked if you can make banana bread without baking soda and instead use baking powder. While baking powder and baking soda are both excellent leaveners in baking, they are not always interchangeable. While I don’t consider baking powder a perfect substitute in this case, if you are in a pinch, you can try substituting 2 teaspoons of baking powder for the 1/2 teaspoon of baking soda we call for in the recipe below. The bread may not brown as well and the texture will be slightly different. Salt, vanilla extract, and cinnamon add flavor to the bread and make it taste amazing. Eggs provide structure and stability to the bread. We use two eggs. If you do not eat eggs, you can try using two flax eggs instead. 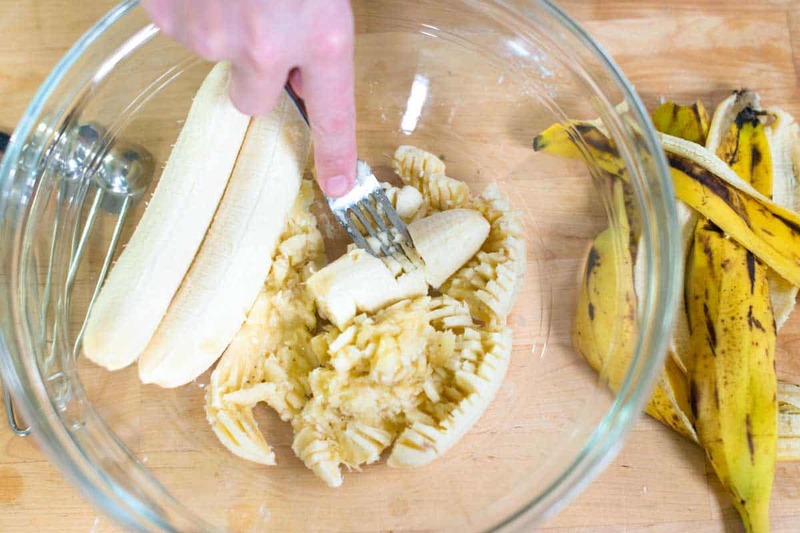 You don’t need a mixer to mash bananas — a fork works perfectly fine. You only need a whisk or spatula for the batter. 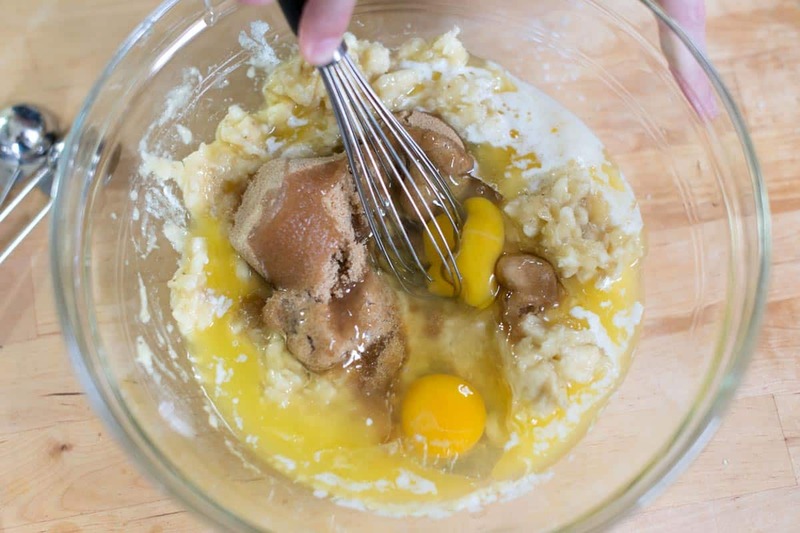 Treat the banana bread batter like muffin or pancake batter and try not to over mix. You’re only looking to mix everything together until you no longer see streaks of flour. This way, the banana bread stays on the lighter, moister side instead of heavy and flat. How Long Does It Take To Bake? The bread bakes for about one hour. Even though that seems like a long time to wait, the smell of banana bread baking in the oven is to die for. Definitely top 10 on our list of best kitchen smells! Cool to room temperature. Since the loaf continues to cook as it cools, it is best to allow it to cool to room temperature. I cool the banana bread in the pan for 5 to 10 minutes before turning it out onto a wire rack where it can cool completely. If you don’t believe that our recipe helps you achieve the perfect banana bread loaf at home, take a look at what our readers are saying about the recipe! More reviews are in the comments section below. Since we love this recipe so much, we made another version with chocolate chips. For the best, most flavorful homemade banana bread, the bananas need to be ripe — overripe, brown and speckled is even better. Nuts and chocolate chips are completely optional for this. 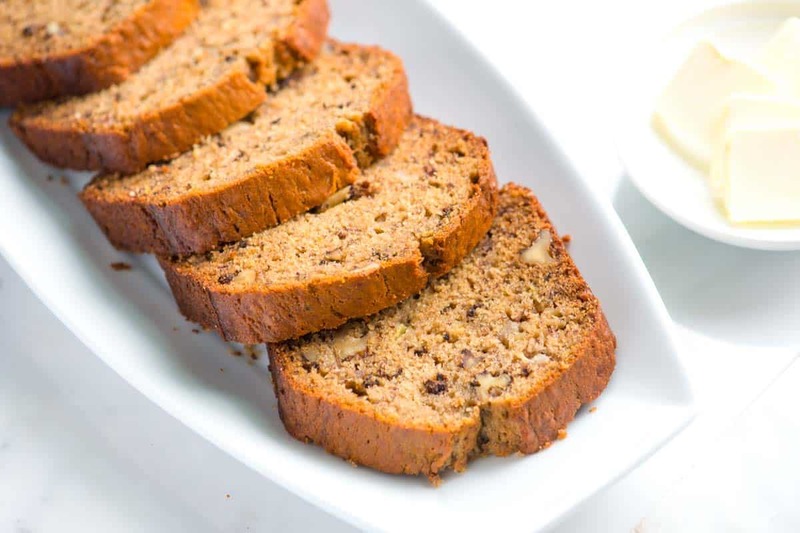 We love the bread both ways, but do enjoy the extra crunch from a handful of walnuts or pecans and chocolate chips banana bread is quite a treat! Switch to a large rubber spatula. Scrape the sides and bottom of the bowl then add the dry ingredients in 3 parts, stirring gently until they disappear and the batter is smooth. Stir in nuts and/or chocolate chips. Pour batter into the pan and smooth the top. Bake 55 to 75 minutes, or until a knife inserted into the center of the bread comes out clean. Very good and moist. Easy to make. Did not change anything. 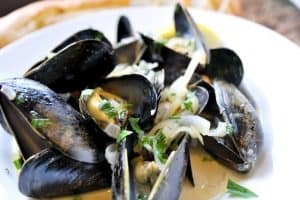 Hi, My work friend recommended this site, I find lots of great recipes. I will try one by one. Thanks a lot. I am returning to let you know how my low carb Banana Nut Bread tasted. It is yummy and very moist! I am very pleased with the texture as well. It is not very sweet but just sweet enough for me. If you want more sweetness either add more Splenda Brown Sugar Blend or add some Agave which is low in the glycemic index. Thanks again for the great recipe! Just made this bread added another banana since I had 4 overripe on hand.still cooling, a slight mushy on top but guessing it’s the extra banana cuz everything else is perfect! Love this recipe, I baked using baking powder instead because I had no baking soda at the time but added an extra egg. The bread came out moist and very tasty. Very easy to make so thanks for sharing. 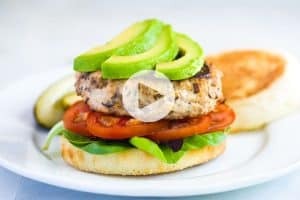 I made this recipe and it was delicious!!! Maybe a little too dry but the flavor was great. So I looked up other recipes and tried again. I added 3 tablespoons of mayonnaise. I know it sounds gross but when it’s cooked in, it adds moisture. Can’t taste the mayo at all and now it just melts in your mouth! So good. Try it. You’ll be surprised!!! Wonderful!!! I love this banana nut bread. 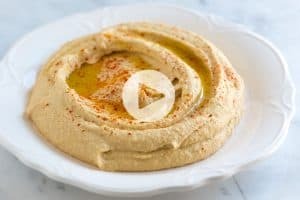 It’s really easy to make and it is delicious. We don’t eat a lot of bananas but when I buy some I get more than I think I’ll need so I’ll have enough to make this bread. My husband and I are both diabetics so I use Splenda Baking Blend Brown Sugar. It tastes the same as regular brown sugar. 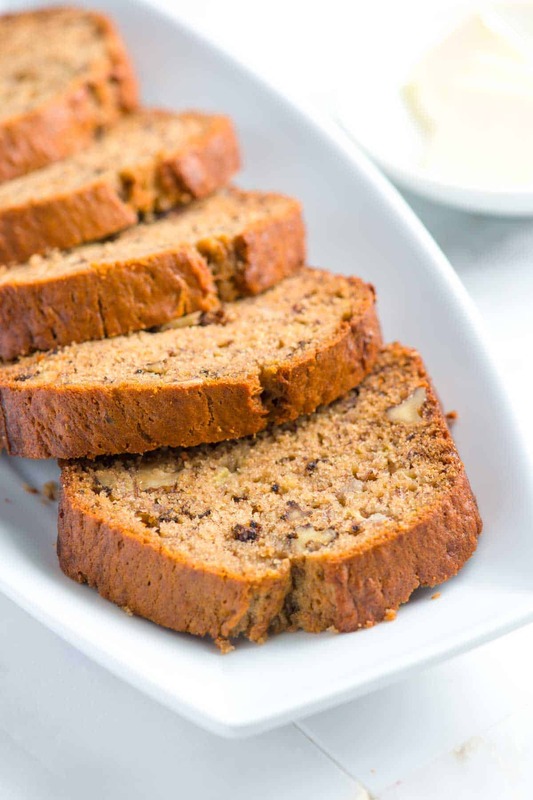 I had been looking for a quick and easy recipe for banana nut bread when I found this one and it is perfect. Thank you so much for sharing this recipe. I will be making your carrot cake and banana bread.I see that the finished product is moist. Thank you for your recipe. The butter makes the magic!! will be making more of your recipes. I’ll write back to let you know my results. Looks delicious. Do you have any advice on how to turn this into a gluten-free recipe? Thank you! Hi Linda, You should be able to use a 1:1 gluten-free flour blend for the banana bread (we personally like Bob’s Red Mill). I substituted Bobs red Mill Gluten Free and it turned out great!! Hi, I’m planning to make this bread soon, but I have a question? At the end of the instructions at “To Finish”, it says: If browning too quickly, loosely cover with foil. Are you saying it should be covered? as you don’t state it covered? Or are you saying to cover it at this point to prevent it from browning too much? I am sorry, but I just do not understand that sentence? Thank you soo much. Hi Evelyn, You bake the bread uncovered. However, if you start to notice the top of the bread is getting browner than you’d like, you can take a piece of foil and loosely rest it over the top of the bread. This should slow the browning of the top of the bread. You do not mention the banana size or the actual amount of measure, since bananas come in a many sizes, can you please provide the actual measurement, (1 cup, 1.5 cup, 2 cup)? Hi Laura, You’re looking for about 1 1/2 cups mashed banana. I’ve updated the recipe to note this. I don’t eat banana nut bread. My mother has been making it for years and mailing it to my brothers in NYC and NJ. Well I had 3 speckled riped bananas left and I did not want to throw them out. I googled a recipe for banana nut bread and found this one. Well I now eat banana nut bread and it taste delicious.